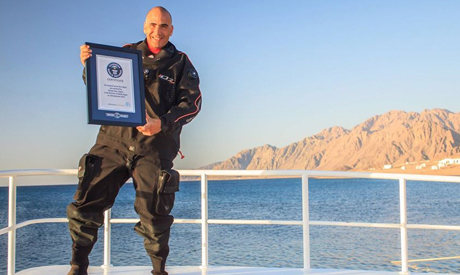 Egypt record-breaking diver: How did he go down the deepest? Egyptian Guinness World Record holder for deepest scuba dive, Ahmed Gabr, said he will break another world record in February of next year. His comments were delivered during a talk at Al-Ahram held by the institution's Science Club on Sunday. Gabr, Kamel and Wanas talked to the attendees about the preparations that went into the ‎record breaking, the risks Gabr faced during the attempt and why he decided to go for it. A: Four years ago, but a clear plan was set only one year and two months ago. Q: How could technical diving be relevant in a country where the majority can’t swim? A: Technical diving is already spread in Egypt but many people don’t know about it and I think it’s the ministry of tourism's role to promote it since we have a great spot in the Red Sea. Q: What do you do about lights? And how do a diver's body get accustomed to the new environment? A: Visibility in the Red sea is Distant, you can see very well to 100 or 150 meters, and starts diminishing at around 180 metres. You can see wrecks, beautiful topography and bigger fish. Air pockets in the body are eventually equalised, mainly in the ear and sinuses. Q: Why didn’t you reach your original goal of 350 metres? A: It’s all about the behaviour of gases at depths. There are many variables at such depths. The Helium I was breathing causes HPNS (High Pressure Nervous System) which causes tremors and that means I could lose control. I started feeling it at 290 meters. We knew there was a possibility of experiencing this. I started to descend at a slower rate, got the 335 meter tag – I couldn’t put the tag in my suit due to the tremors until I reached 280 meters. One cm more could have meant my life. Q: How did you train physically? How did you deal with nitrogen narcosis? A: I had been training physically for a long time ago, and it’s up to you to make sure you’re in exemplary physical condition. In the gas mix Ahmed used, helium replaced nitrogen to lessen the effects of narcosis. Q: How did you eat? A: I had to drink one litre of water every hour and we decided baby food is the way to go since it’s easy to consume and carry, not to mention high calories. Plastic bags connected to tubes are used for feeding. Q: How deep did you go down in your training dives? A: The maximum was 220 meters, we didn’t have to go down deeper than that, it’s not like running or swimming, where you gradually increase your distance or speed, a lot of the training is psychological. Q: What do you remember seeing under the effects of the depth on you? A: You don’t have the luxury of sensations, all I saw were the depth marks on the rope and the tag which I grabbed, I was focused on grabbing it and going up, that’s all. A: There’s another record to break in February 2015, the application for it was already approved by Guinness, and another two planned after that. Q: What were some of your worst fears? A: I couldn’t sleep for a while before, I was afraid the tremors I can get from HPNS (a physical condition caused by breathing helium at depth) would make me drop the tag after I grab it. I was also afraid my support diver who would take it out after meeting me underwater would drop it on his way up. Q: Are there female technical divers in Egypt? A: Of course, one of my deep support divers was a female, Jenny Lord, who is also one of the godmothers of technical diving in Egypt. There are many in Egypt. Q: Would you be a mentor for someone who wants to break your record? A: Yes, but it depends on who is going to do it and what the plan will be. They also have to be doing it for the right reason, if someone will be doing it for fame they will fail. It has to be seen as a scientific exploration; to see how deep a human being can go down.